Xiaomi Mi 8th Anniversary Edition Pricing and Variants Leaked - Playfuldroid! Xiaomi is heavily pegged to launch the Xiaomi Mi 8th Anniversary Edition smartphone on May 31 through an unveil event in Shenzhen, China. It is speculated that the event will be called Xiaomi 2018 Annual Product Launch event and the 8th anniversary phone is also being referred to as the Xiaomi Mi 8. If the smartphone is really launching by the end of this month, Xiaomi could be prepping up for its press conference. 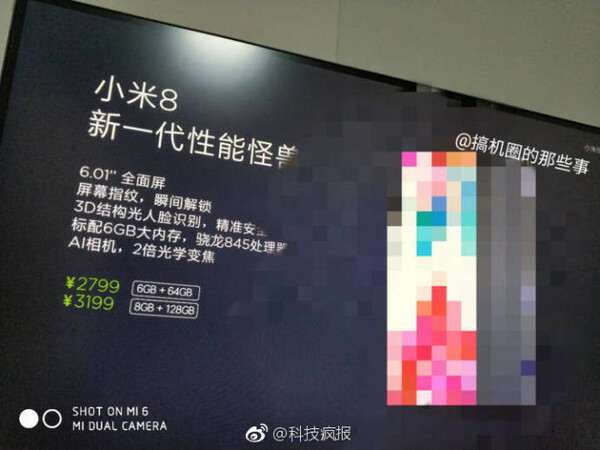 A leaked photo of a presentation of Xiaomi Mi 8 smartphone has surfaced online. It has revealed that the pricing of the two variants of the Mi 8. As it can be seen in the above image, the Xiaomi Mi 8 features a 6.01-inch display that carries support for in-screen fingerprint scanner. The other features mentioned in the image include 3D structured light facial recognition, Snapdragon 845, 6 GB of RAM and AI camera with 2X optical zoom. The base model features 64 GB of storage and 6 GB of RAM whereas the highest configuration model has 8 GB of RAM and 128 GB of storage. Both the variants are respectively priced at 2,799 Yuan ($439) and 3,199 Yuan ($502). In the past too, the rumor mill has leaked pricing and variants information of Xiaomi phones before their official announcement. There is no confirmation on the authenticity of the above image. Hence, it is advisable to digest it with a grain of salt.